Guest Post by Ellie Saunders, a a young mother who is passionate about digital businesses. She is currently enjoying her marketing role at eVoice, a place where businesses can get virtual and toll free numbers. Marketing is in a constant state of change. To remain competitive your marketing strategies must evolve with the market. Google's algorithms, customer expectations and your budget are all always changing, and if you don’t keep pace you will be left behind. Here’s the top reasons why your marketing strategy needs an update. As you know, marketing is always changing so if you haven’t changed your strategy for a few years, it probably needs an update. Depending on your niche and type of marketing there can be changes almost every day and you must account for these new developments. Even if you feel your strategy is working fine, you should still be looking to capitalize on new marketing channels. Things like customer analytics, content marketing and account-based marketing have come a long way in recent times and should definitely be considered. People’s preferences, and society as a whole, change almost as much as your marketing strategy should. And incidentally, the changes in preferences are one of the things driving the need for you to update your marketing strategy. Stay up to date with your target audience and know what they want and why they want it. While this is the crux of marketing, it’s important to understand that these “what’s” and “why’s” change. If you’re marketing strategy doesn’t account for these changes, your customers will look somewhere that does. Most people consider marketing as a way to communicate a product or a service to an audience, but it’s also just as important to listen. An effective marketing strategy should understand the customers and address their preferences, needs and problems. This means incorporating ways to receive and evaluate feedback from your customers. The method will depend on your customers - some like a contact form which can be included on your website, while others like physically calling, so you should set up a virtual phone system like eVoice to improve your communication channels. 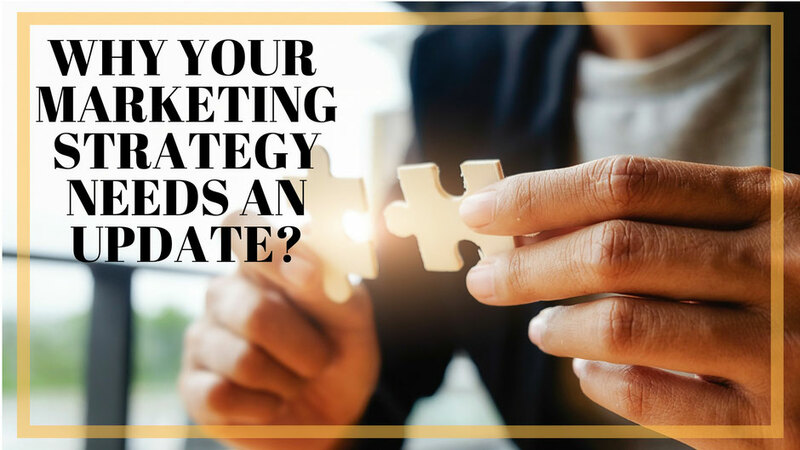 If it’s been a long time since your marketing strategy has been upgraded you might find that it has become full of inefficiencies. With so many facets in marketing it can be easy to lose sight of the big picture. Inefficiencies can come from not having a cohesive plan across all marketing areas or poor communication and coordination between your team. In other words, how are the parts of your marketing strategy working together towards the ultimate goal? Start with your goals and find the best marketing strategies to get you there. Then ensure everyone is on the same page. With over 2 million blog posts going live every day, marketing is no longer about sending large amounts of content out to the masses. Instead, customers are looking for value and knowledge. Put an emphasis on quality content. Every successful business has their own unique experiences and insights so find a way to leverage this. It’s also worth noting that it’s not enough to repeatedly produce content that follows a formulaic approach to SEO. In the early days of Search Engine Optimisation, a good SEO could produce content that looked great to Google’s algorithms, and so this content would rank well. Today, this approach simply won’t work, the algorithms and audiences value original, quality content that engages the reader. Make sure your content provides value and is written for a human reader. Pay homage to the old saying “quality over quantity”. As the market and your strategies evolve, it goes without saying that your budget should change accordingly. Take a close look at your marketing strategy and decide what is and isn’t effective and reassess what deserves your marketing dollars. What you’ve always done might not be working as well as it used to, and therefore your spending should be adjusted. Many people are concerned with changing the way they spend their money, worrying that they can’t afford to take a new risk. Sometimes the right question is, can you afford not to take the risk? every 12-24 months and if any of the above things are occurring it is more than likely time to change. Find what’s working, eliminate what’s not and don’t be afraid to try something new.